Nerf vibes on the latest Nike KD 12. Kevin Durant's 12th signature sneaker with Nike, the KD 12, first surfaced earlier this week in a black and white colorway, bearing a strong resemblance to Nike's laceless Adapt BB sneaker. 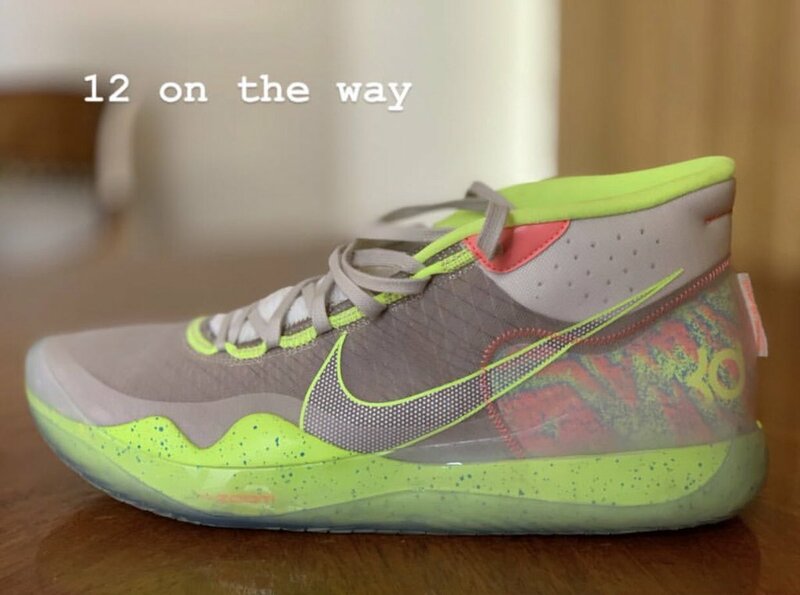 Today, the KD 12 popped up again, this time sporting a much more colorful design with hits of neon green and a nerf-style graphic around the heel. The Nike KD 12 appears to be a completely revamped look to Durant's signature line, especially when compared to the flyknit/flyweave construction of the KD 11, KD 10, KD 9 and KD 8. Not to mention, the cut of the KD 12 is considerably higher than his recent run of low-top silhouettes. The one constant between the black/white KD 12 and this multi-color joint is the clear, translucent TPU (thermoplastic polyurethane) that wraps around the midsole. Nike has not yet announced release details and specs for the KD 12, but WearTesters reports the kicks will make their retail debut on April 7 for the retail price of $150. Mark Ruffalo Rejoices After Seeing "Avengers" Poster: "So I Wasn't Fired?" La Toya Jackson Attends MJ Tribute Show Following "Leaving Neverland"